Well, no, I haven’t seen The Blues Brothers, Toy Story, Deliverance, Spaceballs, Jurassic Park, Forrest Gump, Rain Man, Austin Powers, Top Gun, or any of the other 200 or so films that you’re assumed to have seen in order to possess basic cultural literacy today. And yes, I feel kind of stupid and out of the loop because of my ignorance, but now I’m working to fix it. Like it or not, movies are the literature of our age. It’s rare for someone to quote from a book they’ve read but it’s everyday’s business for someone to use movie quotes or situations to explain a point or make a joke.. I find it amusing and mildly vexing when, during the course of a writers group, someone will illustrate their point about fiction by drawing an example from a movie. (“You see, it’s just like in The Silence of the Lambs when Hannibal is talking to Clarice.”) It’s seriously kind of hilarious that in a group dedicated to the written word, we’re using film references instead of examples from short stories or novels. I know that this happens because people do watch a lot of movies and barely read a book a year, but still. 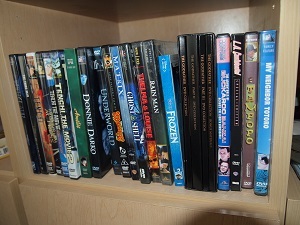 It also astounds and puzzles me how much time a lot of people devote to movies. I can’t count the number of times I’ve had discussions with friends and coworkers where they’ve commented quite casually like it was no big thing that they watched five movies over the weekend. That’s more than a year’s worth of film for me in just two days! About six months ago, I decided to do something about my movie ignorance. I set up a spreadsheet in Google Drive and made a list of films that seem to be important to American culture. Some of these films are considered legitimate classics, like The Graduate or Taxi Driver, but for the most part I’m not going for classics. I’ve assembled this list based on how often I notice people discussing movies online or in person, not based on what academics and film critics believe are the best-made films. Therefore, the list has titles like Wayne’s World and Tropic Thunder instead of a bunch of Fellini and Bergman classics. In addition to movies people often discuss, I have peppered the list with less well known films I’m just personally curious to see, like Metropolitan, La Femme Nikita, and both the 1972 and 2002 versions of Solaris. I started watching movies for this project on June 7, 2014 and have seen 20 films since then. That’s about five per month, which is way more than I used to watch. Here’s a link to my spreadsheet, which lists what films I plan to watch and which ones I’ve seen so far. Note that the first 30 or so movies in the queue are ones that I can quote from even though I’ve never seen them, so I’ve given them higher priority. Also, the spreadsheet has additional tabs for the movies I’ve watched ever, watched since I started this project, and TV series I’d like to see or rewatch. What must-see films can you recommend that are not on my list? ← A book made entirely of chrome? Astounding! Many of these are in the History or To Be Watched sections of the spreadsheet. Thanks!